This is the second year of a three-year partnership to celebrate students who have developed different aspects of work readiness including soft skills and learnability – the desire and ability to continually learn new skills to be work ready and to stay employable for the long term. Across Europe ManpowerGroup volunteers will engage with thousands of Junior Achievement students and help them to build their employability for successful futures. ManpowerGroup will mentor young people and be part of the jury at national and European Competitions. 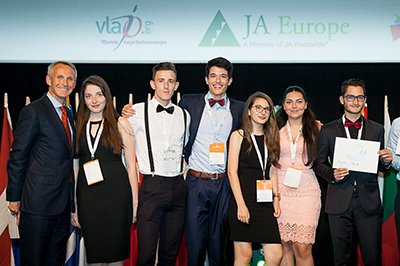 The winner of each country will then attend the European finals of the 29th JA Europe Company of the Year Competition in Belgrade, Serbia in July where the Ready for Work 2018 Award will be presented. Today ManpowerGroup will join Junior Achievement Europe for the "Leaders-for-a-Day" job shadow experience bringing together students from across Europe in Brussels for a two-day event where leaders will share insight and practical guidance on how to get ready for work in the Digital Age. "In this Skills Revolution where new skills emerge as fast as others become obsolete and digitization continues at pace we see the growing value of soft skills – or human strengths," said Stefano Scabbio, President of Northern Europe, Mediterranean & Eastern Europe for ManpowerGroup. "Skills like communication, collaboration and the ability to adapt are critical. That's why we're partnering with Junior Achievement to help young people upskill and nurture these strengths so they can adapt to a fast-changing world of work. We have a responsibility to help young people become work ready, not just graduate ready. We're delighted to continue our longstanding relationship with Junior Achievement to build learnability for thousands and get young people across Europe ready for work." ManpowerGroup is also providing its innovative digital tools to help young people understand the critical skills needed to transition from education to employment by providing access to its Learnability QuotientTM and Digi Quotient TM assessments. These scientifically validated assessments will be available to all students so they can find out what type of learner they are and how ready they are to lead and succeed in a world of work that is more digital than ever. ManpowerGroup's U.S. partnership with JA was also recently recognized in New York with the award of the President's Volunteer Service Award for its contribution to helping Junior Achievement inspire students every year to dream big, identify their passion and reach their potential. "Across the U.S. we've invested time and dollars to bring the world of work to life for more than 45,000 young people over the past ten years," said Nafessa Jackson, ManpowerGroup's Community Investment Manager. "Our employees volunteer at JA BizTown and JA Finance Park, they deliver Excellence Through Ethics training to local high school students and support blended learning to build critical financial skills. We're honored to be recognized with this award and proud that the skills and expertise of our people who volunteer can make such a significant positive impact in our community."